Synopsis: The U.S.S. Enterprise is sent on a mission to bring home a rogue Starfleet commander. When the first installment of a series is so solid, there always seems to be a gamble and so much at stake when the sequel comes out. J.J. Abrams struck gold four years ago with STAR TREK. He was able to completely de-stigmatize a series for new fans, like this one, while keeping the heart and nods to the original material, and there are many callbacks to older Trek lore in this film. So was he able to strike gold twice? Absol-freaking-lutly. Not only was he able to make a great film, he made an even better film. The plot itself is fairly simple: rogue Starfleet Commander begins an individual war on Starfleet and our Enterprise crew is sent after him. This film, with a 133 minute run time, could have easily dragged, but it was perfectly paced. The writers also got creative with the actions sequences with a mix of tense space battles and brutal hand-to-hand combat. This was the first film to be shot in IMAX and then unconverted to 3D. The 3D never felt dark, the action sequences were never muddled or hard to follow. Seeing this in IMAX was spectacular. There were a couple sequences where the end result is VERY obvious, yet I still was tense and held my breath until they were over. The best aspect of this film is since the characters are already familiar, we don't have to spend a lot of time introducing and establishing their relationships. The script lets the characters explore and dive deeper into their camaraderie. Writers Kurtzman, Orci, and Lindelof really upped the banter between Spock (Zachary Quinto) and Kirk (Chris Pine). I'm predicting some of Spock's comebacks in this film will quickly seep into the nerd vernacular. Pine has really come into his character with this film. Maybe he was given more material to work with, but his Kirk really got to me. I was wholeheartedly invested, and by the end of the film, I hated (and by hate, I mean love) the range of emotions he put me through. One fault of the script is only a few characters are dynamic. Most of the supporting characters (Bones, Sulu, Scotty, Chekov) never have a chance to develop and end up being very one note. Granted all their notes are great, but it would be nice for future films, which there most certainly will be, if they're given a little more weight. However, Spock, Kirk, and semi-sympathetic antagonist John Harrison (Benedict Cumberbatch) are all given ample screen time to dive deeper into their respective characters. Speaking of, let's talk about Benedict Cumberbatch for a moment. He's everywhere this year, and might possibly have been the best part of the film. There's something about his voice; it's reminiscent of a Morgan Freeman-god-like quality. Maybe it's his British accent, but mark my words, Cumberbatch will be portraying God roles in the latter part of his career. But I digress. His portrayal of Harrison combined the perfect amount of villainy and sympathy. Anyone paying some sort of attention knows that there were secrets swarming around what his true identity while the film was being promoted. Having almost no prior background knowledge of the Trek universe, I found the overall arc of his character very satisfying and one of the better painted villains in an action film. But seriously, he could read the phone book, and I would sit and watch him in awe. 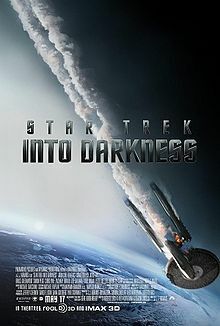 Even though STAR TREK INTO DARKNESS has some minor issues with secondary character development, the action scenes, comic relief, and Cumberbatch all make up for any indiscretions. Abrams was able to build and expand upon this universe, and now that he has really established his mark, it would be fun to see a film that pushes to the edge of exploration. After all, the U.S.S. Enterprise crew are supposed to be explorers right? This film kicked down the door of the summer season. Go see this yesterday. If he can do this for Star Trek, I have fewer worries about the Star Wars films he's involved in. No I haven't seen Wrath of Khan, but that's what I've heard. I recognized some of the more obvious callbacks to that film, but I'm pretty new to the Trek world. And I totally agree with Star Wars. They just need to find the right writer for it.